Steel fish tape is pretty popular for pulling cables because of its strength and durability, but when it comes to electrical work, any type of metal is a bad choice. 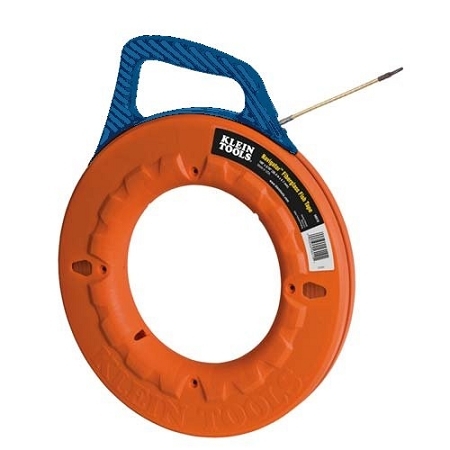 A better idea would be to use non-conductive, Fiberglass Fish Tape like the Navigator from Klein Tools. Complete with a 7-inch leader to make cable installations nearly effortless, this pull tape also has a tensile strength of 500lbs. 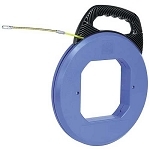 In addition to ease of use and power, the Navigator fish tape has an enlarged eye-loop, able to pull up to 5 un-stripped AWG12 wires. All 100ft of the non-metallic draw tape winds up into a tough, rugged, impact and UV resistant plastic case. Designed with reinforced, molded ribs, the blue Grip-It handle makes it easy to carry around the winder reel, even with gloves on. There are four viewpoints along the Klein Tools Navigator case so you can visibly see how much fish tape is left while in-use. 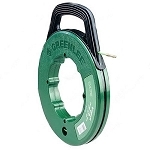 If you only have one hand free, no problem; the reel turns easily in either direction for one-handed operation, and has an enlarged guide slot for dispensing low-friction, fiberglass fish tape quickly and smoothly without kinking or jamming.